After an early start of dragging what felt like a dead body in my case across half of Trinidad (ok so we were the closest possibly but pulling a case on the cobbled streets at stupid o’clock in the morning = not my idea of fun and made the whole short walk feel endless!) 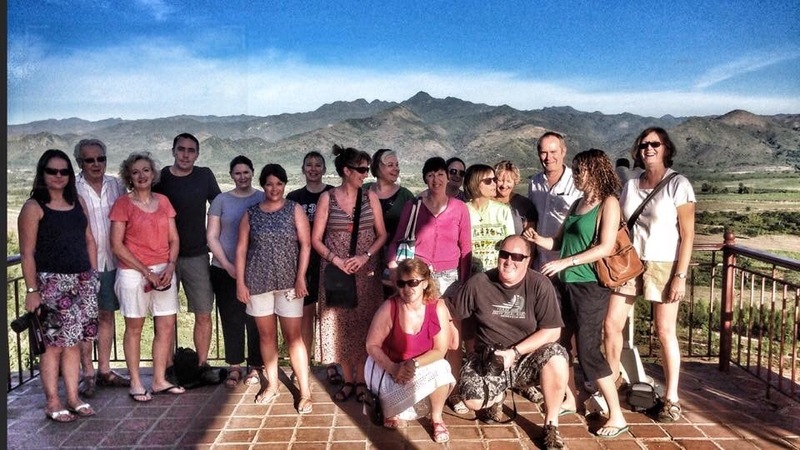 we headed out to a scenic viewpoint of the surrounding area and posed for a quick group photo before heading on to Santa Clara. The main focus of the city now really (bar the University) is the Complejo Monumental Ernesto Che Guevara. Its on the south west side of the city about 1km from the centre and it is here that gigantic, no seriously, MASSIVE monument (pretty classic Cuban revolutionary style – big, bold & concrete!!) to Che lies. 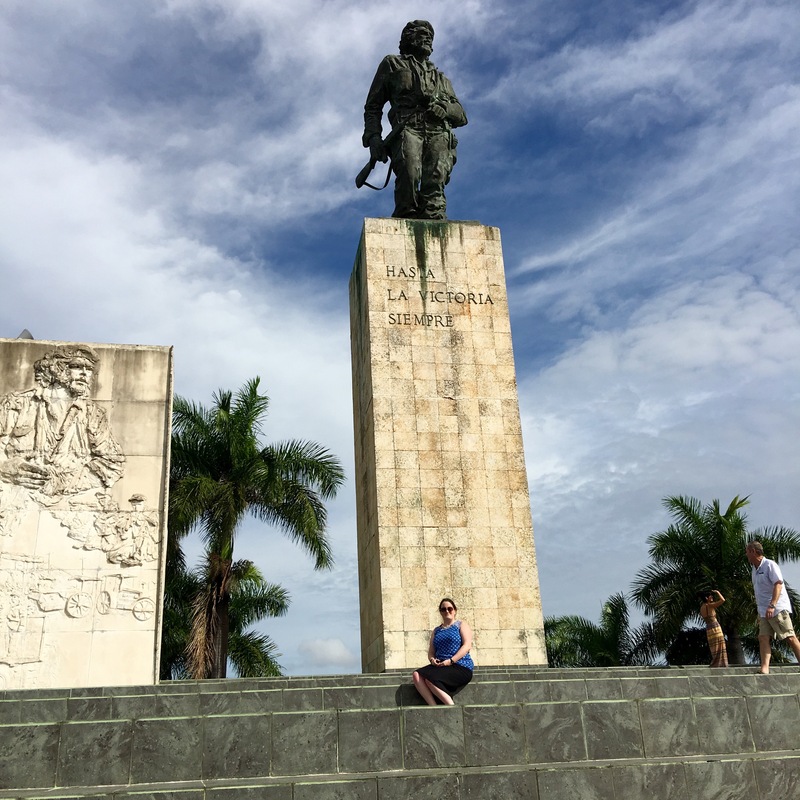 There are grey steps leading up to four big chunky monoliths atop the tallest is the impressive, dominating statue of Che – dressed in his usual military gear and on the move with his rifle in hand. Spreading out in front of this is the Plaza de la Revolución – similar to that in Havana and mainly just an open space with two huge poster boards the far end of the square to the monument with revolutionary slogans inspired by Che himself. You can just about squeeze me in the bottom of the picture when trying to get the whole monument in one shot! Underneath this monument and sort if behind was where you entered the Mausoleum and the Museo and Memorial al Che. No bags and obviously no cameras were allowed at all in either of these and in the mausoleum itself, clearly no talking. The queue was long and it appeared that those of us wantibg to go in, pay our respects and so on were all lined up according to tour group and were being called up a group at a time. The mausoleum is a softly lit (and cool which was very much appreciated at this time if day as I was melting) the atmosphere of respect and reverance was moving. Che’s remains lie in a kind of tomb in which has an eternally flickering flame, also here are the remains of several of the Peruvians, Bolivians and Cubans that died with him in Bolivia, each of whom are commemorated by a simple stone portrait which has been set into the wall. 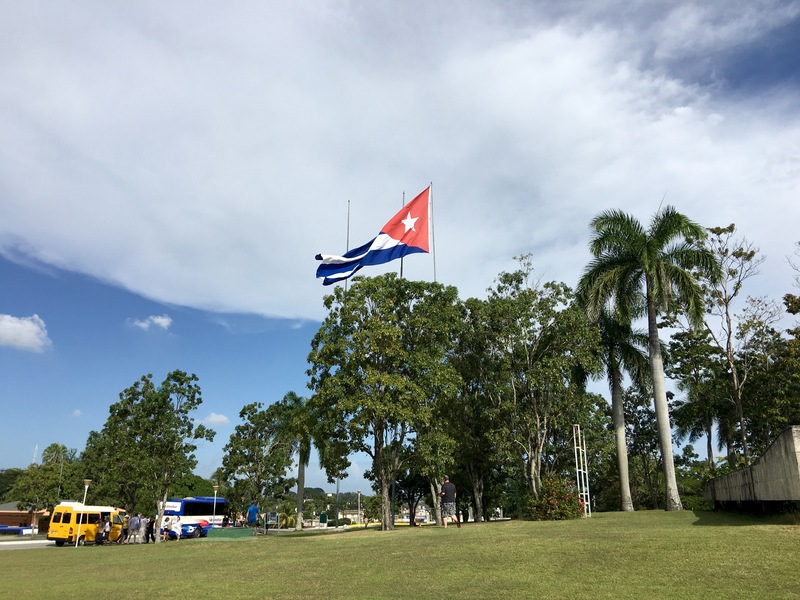 An ideal place of remembrance for such an icon in Cuban history and indeed culture. 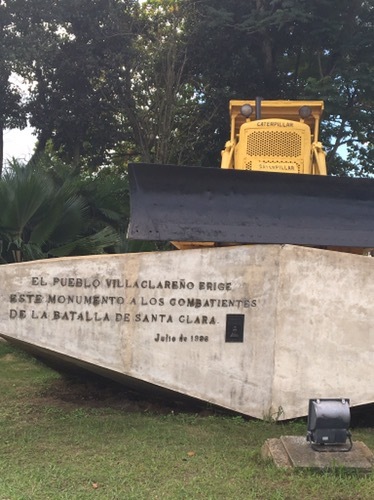 The small museum dedicated to his life was fascinating with a whole load of photos on the walls showing Che from his early childhood through to his life as a rebel in the Sierra Maestra to his role as a Cuban statesman in the early years of the revolution. It was amongst these photos that I spied him playing rugby and it transpires that he once played for Argentina! This made me chuckle a lot. Other than photos there were other bits and pieces that he had owned and worn throughout his life as well as a plethora of his guns, I’d switched off by this stage as while interesting, I’m not sure I wanted to see lots of the guns that he used in combat but still it gave you quite a good picture of his entire life rather than just the sections linked to the revolution. Once we had finished looking around there I popped out to see the memorial cemetery which was further back behind the monument. 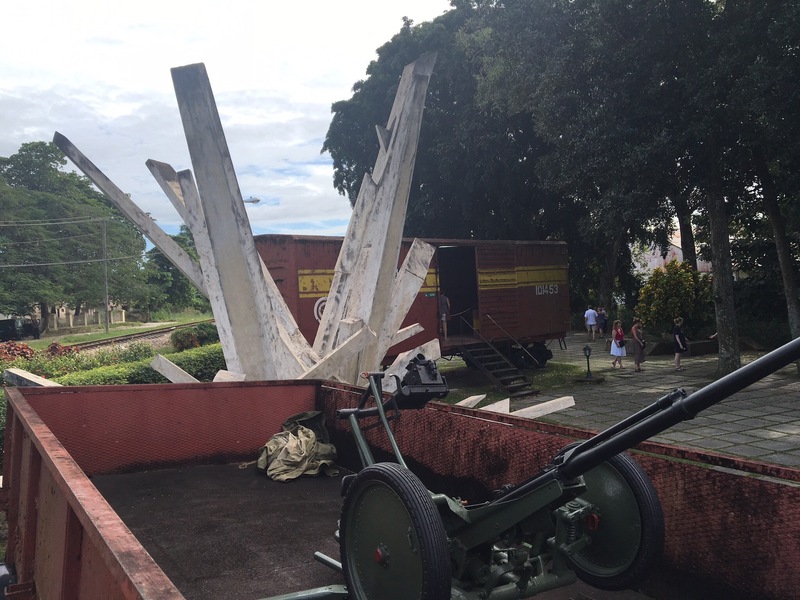 Here were the memorial graves of a number of the casualties of Che’s rebel column – Column 8 which he led from Sierra Maestra at Santa Clara. As they pass away even up to now they are being added with their rank and dates of their life to the cemetery. Quite moving. 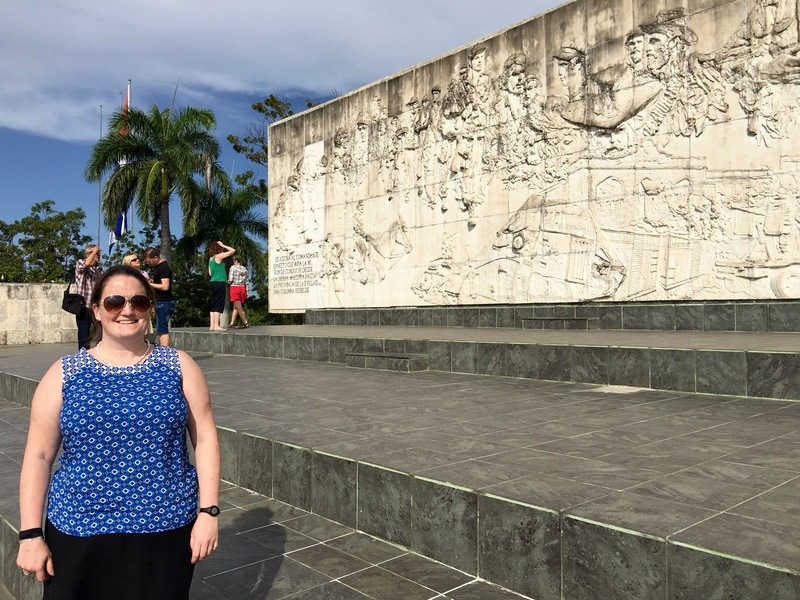 Our next stop before we carried on to Havana was another monument that is key in the history of the city. 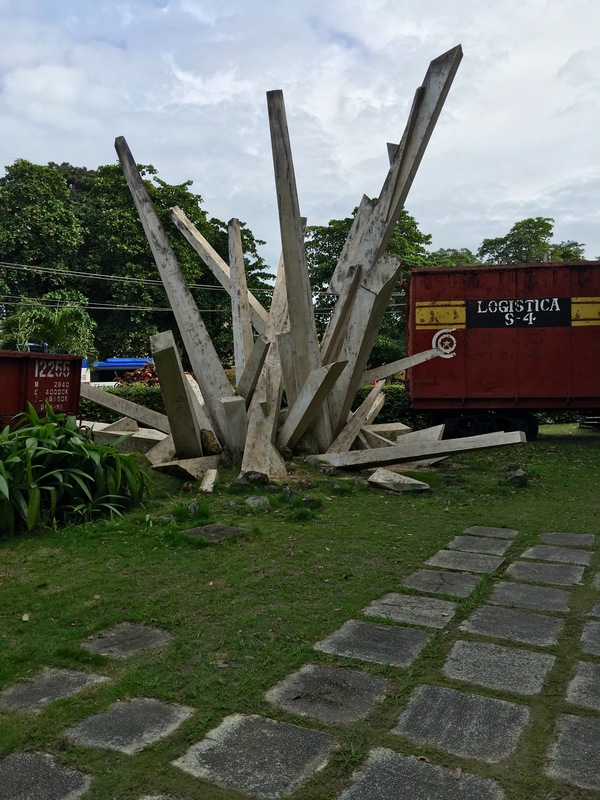 The Monumento a la Toma del Tren Blindado. Essentially it’s the derailed wagons of an armoured train that have laid in this spot since they were toppled off the tracks during the Battle of Santa Clara back in 1958. That was between the dictator of the time – Batista‘s forces and about 300 rebels led by Che & is believed to be one of the last military encounters of the Revolution. 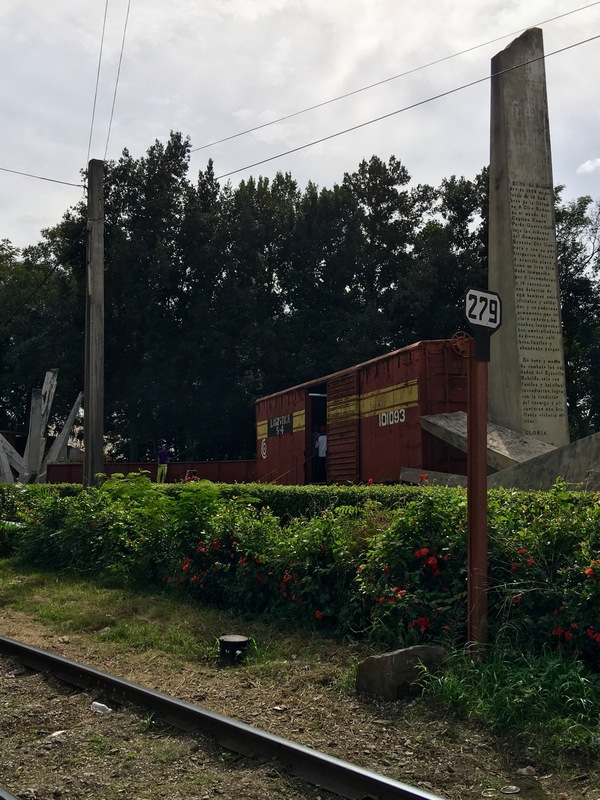 Batista had sent over 10 thousand troops to the centre of the island from Havana to try and prevent the rebels getting any closer to the city – one of the main components of the defensive manoeuvre was an armoured train. Che took the upper hand by using only a small number of his troops to use a bulldozer to raise the rails of the tracks where upon the train crashed and they advised 408 officers & soldiers within it who soon after surrendered. The train it’s self was used by the rebels as a base for further attacks. 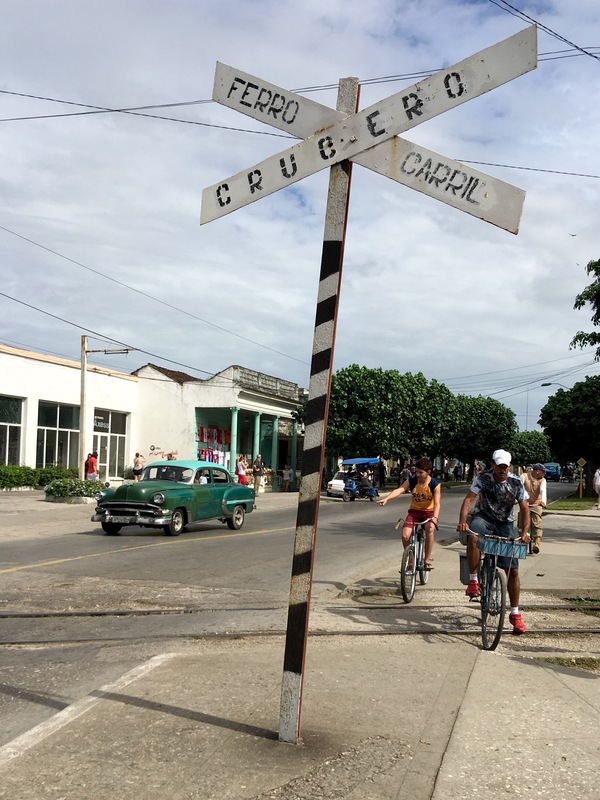 It’s quite a weird monument for such a historic moment as it’s essentially sort of strewn all over the road with traffic passing close to it and almost as if it’s a stumbled upon monument rather than a site of huge significance to the Cubans. Clearly a must for a photo or two – it literally has been just left where it had fallen. Even the bulldozer was still there!! Traffic gayly passing by as if this were just another piece of road with no historical significance?! From here we headed to the same hotel as we were in for our first few in Havana a shower and some severe repacking was needed before I went anywhere or did anything! We had our last meal altogether with Marlon as well of course and no trip on the bus was EVER going to be without another rendition of Bilandos and so we sat – right outside the hotel all of us partaking in one final sing song before heading in (or out!). Posted on January 2, 2016, in Cuba and tagged argentina, batista, battle, che, Cuba, pumas, rebels, revoloution, Rugby Union, santa clara, train. Bookmark the permalink. Leave a comment.